Does a Relationship Exist Between Print and Digital? Has the power of print dissolved? Some think so, especially with the world of online advertisement and digital platforms soaring. However, from a consumer’s perspective that’s not strictly true. Printed materials achieve a personal touch that simply can’t quite be accomplished online. Another perspective is that neither print nor digital can truly succeed without the other — but what are the facts? Where The Trade Buys, specialist provider of printed display panels, is here to offer their advice in the guide below. Many campaigns today are lost without digital. With more consumers than ever before spending time on the internet, businesses would be foolish not to get involved with online marketing. Search engine marketing is one area of advertising that companies are becoming more involved with. As the name suggests, this side of digital marketing focuses on driving a business’ site to the top of the search results around relevant target phrases — from corporate keywords like ‘business cards’ to more fashion-focused targets like ‘dresses’. As a result, this can increase brand exposure and site traffic while improving sales figures. Social media marketing is another area of business activity that wasn’t popular a few years back. From paid adverts to viral campaigns, the digital world has opened up many doors for small and medium companies in particular — exposing themselves to an audience that may not have known they existed and in turn, generating mass interest. The digital world has made room for businesses to begin analysing their audience, allowing them to gain a greater insight to their general behaviour and spending patterns. From tracking analytics, whether this is across social media platforms or the main website, marketing managers are able to identify key areas of interest and create campaigns around this to drive sales. There are many methods businesses can follow to hook an online audience and stay ahead of their competitors. Through a combination of search engine and social media marketing, many brands are beginning to run competitions and deals that are only exclusive to an online following. These low-cost campaigns will benefit from extensive reach. Although more businesses are beginning to take their focuses online, they shouldn’t neglect the power of print and the opportunities that can come off the back of it. Print very much has a place in modern advertising as it can offer a personal touch unlike no other and generally has a longer life cycle which is always beneficial for the exposure of your brand. Take printed leaflets for example, once they have been posted through the door, whoever picks them up will have to acknowledge your materials! As well as door-to-door print advertising, business merchandise has not taken a backseat since the sprout in popularity of online promotions. Brand image has never been more important for businesses and shouldn’t be ignored — as a result, more companies are making investments in personalised products that represent what they stand for. Whether this is to help them externally, with the likes of outdoor banners, or internally for your office with the likes of customised calendars. Although printed goods can often be higher in price, they can drive exceptional ROI to your campaign and create a memorable experience for the receiver which should be a core focus for your print campaign. This can be achieved through eye-catching designs and a choice of luxury materials which will lead to a meaningful engagement. 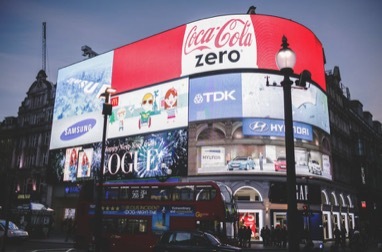 Although online and offline advertising are two entirely separate entities, they can work well together, and some brands are already utilising such methods. Take QR codes for example, more businesses are trying to audiences in the real world to their online solutions. As QR codes are unique and can entice people to be more inquisitive, they can drive immense traffic to online campaigns when printed on banners. Through this method of advertising, marketing departments can track success and gather data on users when they’re interacting with the code. With the data collected from campaigns like this, businesses can record contact information (such as email addresses) if users decide they want to opt-in. When looking closer to news publications, many of them still offer printed versions of their product — blurring the line between print and digital. With an understanding of the influence they have online, they’ve been able to merge two channels together and to distribute stories to a wider audience. Near field communication is another area that should be further looked into when it comes to the relationship between online and offline platforms. Essentially, near field communication is a type of technology that has the ability to connect two smart devices — often with the help of a print medium. For example, a section of a poster can be tapped with a mobile phone which will then take the user to the ecommerce site for a specific product. Online hospitality marketplace, Airbnb has made huge waves in the way that we now book our holidays. Predominantly a digital business with its own website and downloadable app, the company decided to launch its own magazine for registered hosts (those who advertise their property) which is around 18,000 people. This magazine included personal stories of hosts and their accommodation, encouraging interaction with the digital business through print. Although the magazine production has been put on hold since, it’s a good example of how an online business can promote its services elsewhere. Remember those iconic Coca Cola bottles that had labels with your name on? The printed labels for the Share A Coke campaign allowed the drink manufacturer to become more personal with its customers and as a result, buyers then shared their bottles on social media which made it an integrated campaign. As we can see, digital and print both play huge parts in the marketing of a business. But often, they can be most successful when they’re brought together. Next post: Corporate Cybersecurity: Is your business data secure?